Naomi Merryman, a resident of Fort Dodge and Badger for 87 years, died Aug­ust 15 in No­vi, Mich­­igan, days short of her 98th birthday. Mrs. Mer­ry­­man was born August 19, 1920, to Rev. B. A. Olsen, longtime pastor at Badger Lutheran Church, and his wife Ellen. Mrs. Merryman was the second youngest of 8 children and was raised in Badger. After graduating from Fort Dodge Senior High School, she studied at the Minneapolis Inst. of Arts and worked in Chicago at a fashionable women’s clothing store. In 1945, she married her high school sweetheart, Robert Merryman, who with his father, Walter, managed the Messenger for decades. Naomi and Robert were married for 47 years until Robert’s death in 1992. Together, they raised two children, Roberta and Gregory. In her mid-40’s, Mrs. Merryman went back to school and became a medical assistant. She worked at Friendship Haven as medical records supervisor, led the patient activities department, and coordinated all volunteers. Mrs. Merryman was a pioneer in establishing activities and entertainment for the residents — something that is commonplace today but was unusual for nursing homes then. Mrs. Merryman later worked as a licensed real estate broker for several years. In her early 60’s, she returned to school again and became a nurse and a certified nursing home administrator. Cancer of the knee forced her to attend school on crutches during icy winter months. She bravely endured 11 cancer-related surgeries in the following years. After graduation, she was administrator of the Lake Mills Care Center for eight years. During that time, Governor Terry Branstad appointed her to the Iowa State Board of Examiners for Nursing Home Admin­istrators. 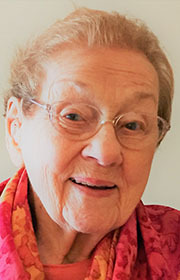 After retiring from nursing home administration at age 74, Mrs. Merryman worked part-time as a teacher’s aide at Fort Dodge Senior High School. After taking a class at the Blanden Memorial Art Museum, Mrs. Merryman began using special French dyes to paint silk scarves and ties, some of which she sold and many of which she gave to anyone who needed a day brightener. In 2007, Mrs. Merryman moved to a retirement facility in Novi, Michigan to be near her son and his family. Mrs. Merryman is survived by daughter Roberta Merryman (Dwight Fellman) of St. Louis Park, Minnesota; son Gregory (Kathy Mammel) of Birmingham, Michigan; granddaughter Rudi; grandson Ben; and many nieces and nephews, including Kurt Wilke (Sandra) of Fort Dodge and their sons, Chris (Andrea), Jon (Tenille), and Ben (Julia). Memorials may be sent to Lutheran Church of the Redeemer, Birmingham, Michigan, www.lcr.church /memorials or the Mayo Clinic, Rochester, Minnesota https://philanthropy.mayoclinic.org/donatemc.